We’ve now been in Thailand for around 10 days and what a whirlwind it’s been! It’s tough enough for the adults, but living abroad will always pose challenges for children too. Here’s how my boys have coped with the move and what we’ve done to help them. We did a 12 hour flight to Bangkok, leaving at 12.30. We generally find flying with children to be completely fine (it’s mostly a case of entertaining them and helping them sleep). You can read our tips for travelling with small children here. However, even I was nervous about 12 hours on a plane with 2 small children! 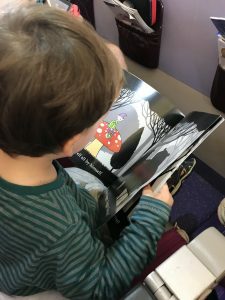 I planned lots of activities for the boys beforehand, so the flight went surprisingly well – you can read about it here. We managed to get the kids to sleep at roughly their normal bedtimes. Neither of the adults slept, so we were all tired when we arrived in Bangkok. We booked a (very nice) hotel near the airport for £20 per night. We booked a hotel for the night before, so we could crash as soon as we arrived. This turned out to be a good plan. Finding the shuttle to the hotel in a busy Asian airport, at what felt like 1am, after doing a 12 hour flight and getting no sleep was a little challenging. I found myself wishing we had carseats so we could just hire a taxi! Eventually we found it. It turned out just to be one woman with a small sign with the hotel logo on it and no English amongst about 20 other people with various signs – not easy to find! There was an airport information stand near door 4 in Bangkok airport that eventually pointed us in the right direction. Once at the hotel we crashed for a few hours. Phew. We spent the next day and night in Bangkok to acclimatise a bit and let everyone sleep before heading to Chiang Mai. In Chiang Mai we rented an airbnb near the MAYA shopping mall, which is know as being a particularly trendy part of the city. Here we spent most of our time house hunting. We found our house a few days ago and have now moved in. I generally try and stay positive about things – that’s the whole point of ‘You Can With Kids’ after all! However, I will admit to being anxious about such a big change for Jack (2 /1/2 years). Was it right to take him out of nursery? Will his development suffer without nursery activities and friends his own age? How will he cope living abroad? Is moving away from family the right thing? I figured Cade (9 months) would be ok – he’s young enough that he just needs a loving family around him and everything else is entertainment. Jack’s more sensitive, though, and quite dependant on his routine. I quickly realised that I didn’t need to worry about nursery. He is far happier and calmer now. He’s getting more sleep (naps at nursery were short) and so the ‘witching hour’ just before bed completely disappeared. As for his development – Jack’s language skills started to improve at breakneck speed from spending all day with us. Turns out a well slept and happy child picks up new skills far more quickly than an overtired one! He enjoys playing with his brother, he socialises with Thai children at the playground and he is stimulated by all the places we’re visiting. Hurray! As to the move itself, the boys coped with the flight and jet lag amazingly well. You can read about our flight here. Jack got over his jet lag in around a week (people usually adjust to jet lag roughly 1 hour per day). He’s been a little on edge and closer to tears, but I think that’s more to do with living abroad and all the changes than jet lag. As a family we’ve been trying to sleep whenever we can. We’re letting our bodies adjust naturally. Maybe adults can get over jet lag quickly, but children need to do it slowly and gently. Jack struggled for a few days when we moved to the new house. He settled down fast, though and is much happier now. He loves having a garden and a bedroom all to himself (we were in a 1 bedroom flat before this). There’s a rather ugly chair that doesn’t match any of the furniture. Jack loves it (‘my drum chair’). We moved it to his room and do his bedtime story on it. He couldn’t be happier. 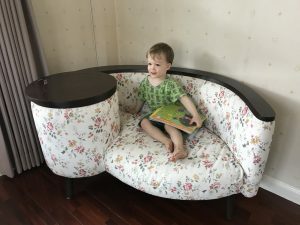 Cade’s been wakeful during the night and has taken a little longer to adjust to the jet lag, but other than that has been completely unfazed by moving to another country and living abroad. Travelling with babies is always easier than you think! There are some great aspects of living in Thailand that the boys are really enjoying. We were dubious about the red bean and seaweed ‘porridge’ (click here for photos and how to make it). Everyone else in the family thinks it’s revoting, but Cade loves it. 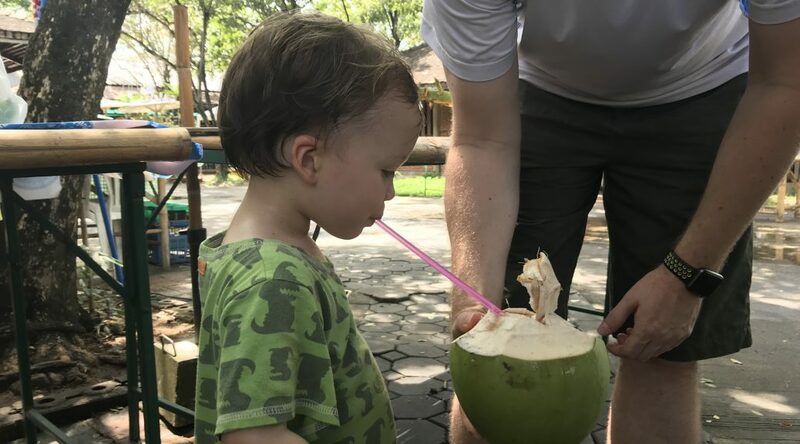 Jack adores the fresh coconuts you can get here. 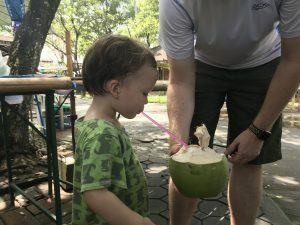 Pictures and timelapse of a man removing the coconut flesh from it’s husk. The kids also love all the attention they’re getting. People squeezing Cade’s cubby little legs and commenting on his white skin. He’s also had quite a few cuddles and selfies with Thai women. There’s a word in Thai that’s pronounced ‘dir-ay’ (sort of like ‘dirty’ but with a glottal stop). People keep saying that to Jack and he says it back. Then they both laugh hysterically. It’s like a strange Jack/Thai woman form of communication that neither Karl nor I understand! All in all it’s been a good move. Sometimes tough, sometimes stressful, but definitely worth it in the end.